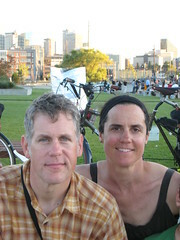 We’re Anne and Tim King, welcome to our blog, Car Free Days. Car Free Days is a phrase we started using with the kids when they were young. When we didn’t want to drive, we proclaimed Car Free Days! We mostly write about family cycling, riding bikes for transportation and family bike touring in and around Seattle, WA. Let’s back up a few or ten or fifteen years for a little history of Anne and Tim and how they started riding bikes and blogging at Car Free Days. Anne and Tim didn’t always ride bikes. In fact, they used to own four cars! They drove everywhere. They drove to work five days a week, dreading their commute. They habitually sat in traffic on bridges traveling at a snail’s pace and listening to NPR. At least they carpooled, but still they drove. They longed to be outside. Weekends were spent in misery too. In search of happiness or just about anything to make them feel good, they drove around and shopped for entertainment, buying stuff they didn’t really need. They habitually drove four blocks to the neighborhood coffee shop to relax and sip Americanos. They were unhappy, stressed out, slightly overweight and never had much energy. After work, they drank wine in front of the TV to relax. When their first baby arrived, Anne quit her job. She learned that babies like to ride in strollers. You see, they cry a lot and strollers calm them down. Anne started to walk a lot. She found another use for the stroller, it could carry groceries. Anne started walking to the store instead of driving. With each passing month, Anne became increasingly happy. She walked every single day with her baby. She didn’t drive much. Tim kept commuting in his car. But instead of carpooling with Anne, he now crossed bridges and sat in traffic listening to NPR by himself. With each passing month, Tim became more and more miserable. When his office moved farther away, Tim’s commute grew to 40 miles round trip. He hated commuting in the car. He gained weight and joked that he was filling up his custom ergonomic desk chair. But he didn’t really think this was funny, he laid in bed at night worrying about his health. Anne and Tim sometimes fought. Tim was miserable, Anne was happy. This wasn’t a good mix. Two years later, another baby joined the family. Since their first baby was now a toddler and wanted to go places, Anne started to drive more. Anne didn’t know anyone in her neighborhood with babies, so she visited far-away friends in her car. Because Anne was driving so much more, and traveling farther, they bought another car. Anne thought she needed a new car to keep her kids safe. She also increased her in-city miles, driving the kids to the library (1 mile away), to museums (2-5 miles away), to story time (1 mile away), to the pool (5 miles away). Even if her destination was only 6 blocks away, she strapped the kids into their car seats and drove them. Why? She didn’t know another way other than the car way. Anne became increasingly miserable just like Tim. Strapping kids into car seats and bribing them with snacks became part of her daily routine. Gone was NPR, her radio exclusively blared the latest Dan Zanes album. She too gained weight. This cycle continued for three more years. Now Anne and Tim were both unhappy. They drove, they were unhealthy, and they continued to drink wine in front of the TV after the kids went to bed. Then Tim started graduate school. He stopped commuting to the Eastside in his car and started walking and taking the bus to the UW. His bikes collected dust in the basement. That year Tim sold his commuting car, they were down to three. But Anne still drove; sometimes she and the kids drove Tim to class, one mile from their house. Tim complained that Anne was putting too many in-city miles on the car. Anne didn’t have another way to get two kids where they needed to go. They argued about cars and maintenance and who was going to keep the cars mechanically sound and on the road. By 2006, they were both fed up with all of the driving. They were done with misery and stress and fighting and unhappiness. They wanted to be happy. Around that time, they kept seeing a neighbor riding by their house on a really unusual bike. It had a platform on the back. It was cool. Anne looked for that woman every day and watched her ride by. The neighbor looked like she was having fun. Anne wanted to have fun too. Tim did what any library student would do, he Googled: long bike, platform, skateboard. He found a company they had never heard of called Xtracycle. The Spirit of Every Day Adventure from Xtracycle on Vimeo. Anne nagged Tim about buying her one of these cool bikes. But Tim didn’t take much convincing, he wanted one too. Why should Anne have all the fun? In early spring 2007, Tim bought two Xtracycle kits that could turn a regular bike into a long bike and could carry kids and lots of stuff. The kits sat in their boxes while Tim finished his coursework, final papers and exams. When Tim graduated from library school, they left the kids with the grandparents for three weeks and went to the Netherlands, Belgium and Paris. They loved the Netherlands and were in awe of all the bikes and the different types of people who rode them for transportation. People young and old rode bikes everywhere. In Amsterdam and Utrecht, Tim and Anne sat on park benches for hours at a time watching people ride by. These people looked content. They looked happy. Not many of them were fat. They didn’t look stressed out. When they returned home, Tim finally assembled their Xtracycles. And they started riding them everywhere. They embraced these bikes completely, wholly, and almost religiously. They remembered how biking was done in the Netherlands and Belgium, with ease, little complication and in regular clothes and footwear. Why couldn’t this type of riding be done in Seattle? They stopped driving. Their cars sat parked in the driveway. Why drive when biking is so much fun? At the same time, Tim created a blog so they could record their journey and daily adventures on bikes. They also wanted to share their experience with others. They titled the blog Car Free Days because this is a phrase Anne and Tim had started using with the kids when they didn’t want to drive. A month after they started riding Xtracycles, Anne and Tim went 22 days without driving. This was a record. And it meant Anne and Tim were officially addicted to riding bikes. Anne and Tim discovered that riding bikes for everyday transportation was fun! An entirely new, simple, less complicated and more meaningful life was revealed to them. Gone was the stress that used to weigh them down. Gone were discussions of parking and traffic and commute times. They stopped drinking wine in front of the TV after the kids went to bed, and started writing blog posts and reading what others had written. Tim got a new job that was closer to home and started riding his bike to work. Instead of choosing his fast road bike, he rode his Xtracycle to work because it could carry stuff. He could stop on his way home from work and pick up groceries or a kid or just about anything. Tim’s eyes started to sparkle again. He was happier. He actually looked forward to his commute. While Tim was at work, Anne rode both kids around on her bike. She didn’t see anyone else doing the same thing. At times she felt a little weird, but she was having so much fun, she didn’t care if she was weird or if she was the only mom to show up on a bike. The blog helped her feel less weird, she discovered people in other states (and countries) who were doing the same thing. Even though she didn’t see other moms riding bikes in Seattle, knowing they were out there in other cities made her feel less weird. A couple of months after getting the Xtracycles built, Tim sold another car. They were down to two, one of which was an old truck they never drove but that Tim couldn’t part with. The kids loved the long bikes. On weekends Anne got a break from carrying two kids, Tim carried one of the kids on his bike. They rode all over the city on Xtracycles. This bike thing was addicting. They didn’t notice while it was happening, but their lives became fuller and more meaningful. Riding bikes made them happy. A big reason for me lately is: it’s just fun and I want to mix things up a bit. Quite frankly the day to day tasks that go along with keeping a household going – grocery shopping, kid schlepping, and home maintenance can get a little tedious. Riding my bike to get around makes it less mundane. It’s fun to get outside and ride: I get some exercise, breathe fresh air, smell the smells, see the sights, slow down – stop and notice things I couldn’t possibly see from a car. Yeah, it takes a little longer sometimes (not always) but I really don’t have a time crunch most of the time. When I drove everywhere, my life was filled with a lot more dread. Now – it’s a lot more fun. The kids really like it too. Bombing down the hills while sitting on the snap deck is a lot like riding a roller coaster.They love it. Even then she was talking about fun! Fast forward to 2013, and Anne and Tim are still riding bikes. The four automobile fleet diminished down to zero for about a year, though now it’s back up to one. But they don’t drive it much and mostly use it to #getoutofthecity for hiking and skiing and so they can keep their cheap car insurance policy for zip- and rental-car usage (a whole ‘nother future post). They continue to have Car Free Days, weeks and sometime months. One big difference in six years, aside from the fact that they no longer carry kids on bikes because their kids ride their own bikes, now they have friends who are doing the same thing! Xtracycles and other kid-carrying cargo bikes are no longer a rare sight in Seattle. Every day they see families who have made the same choice they made all those years ago, to use bikes as every day transportation.More families are discovering that bikes are fun. Kids love them. And riding bikes with kids is a great way to get around the city. They’re glad they are no longer alone. If you want to follow their journey, grab a cup of coffee and start at the beginning! We hope you enjoy our blog. And we encourage you to try riding around town. 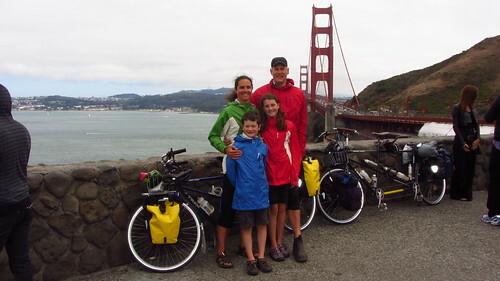 If you’re feeling ambitious, take your family on a bike touring adventure, we guarantee you’ll have lots of fun! Get in touch if you have more questions.